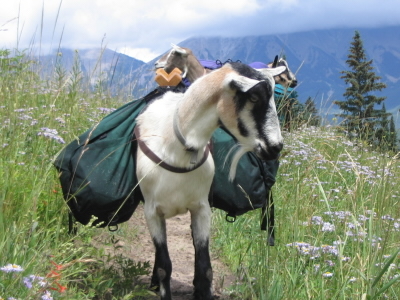 This page is dedicated to the Back Bone of Summit Pack Goats -- Our Pack String! 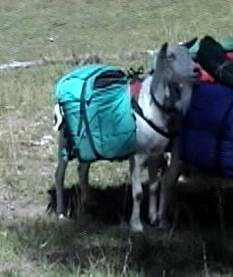 Like a fine wine, it takes time to develop a mature pack string and our boys are growing up. 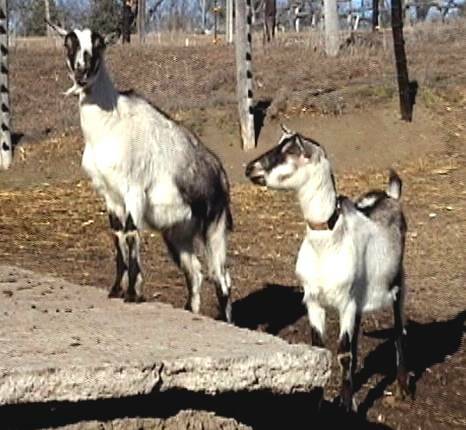 The goats most commonly used for packing are wethers (castrated males), from the larger dairy breeds. A good sized wether is 36" tall at the shoulder and weighs 200 pounds. 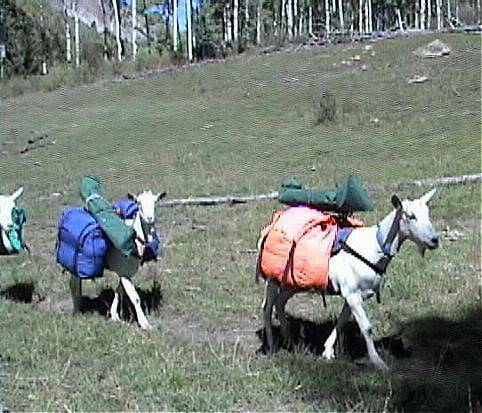 A goat in good condition can carry 25% of its body weight or approximately 50 pounds and can travel 5-12 miles per day depending on terrain. 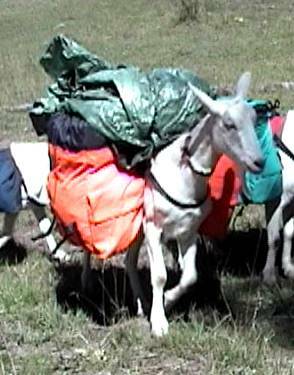 Finally 2005, Summit Pack Goat has a pack string with adult wethers of Toggenberg, Sannen and Sannen/Alpine, and these boys can haul. We've taken strings of 13 goats, but no more, these boys are big, proven, and get the job done. One hunter and 4 of these boys can bring out an elk. Jasper is our oldest packer. 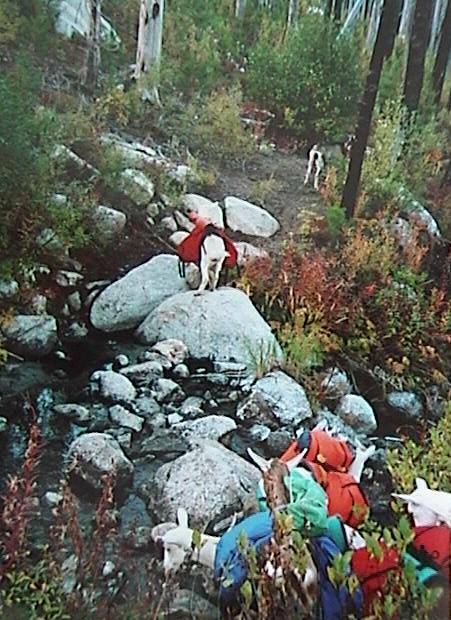 Jasper can haul a load and navigate a trail. 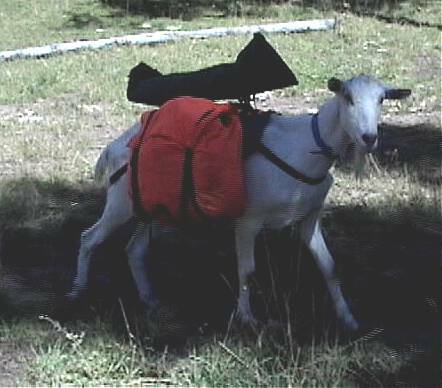 He is currently our largest goat with Coke following closely on his heals. Jasper stands 36" at the shoulder. Coke is our second in command on the trail and in the barn. Coke has packed with us several seasons. 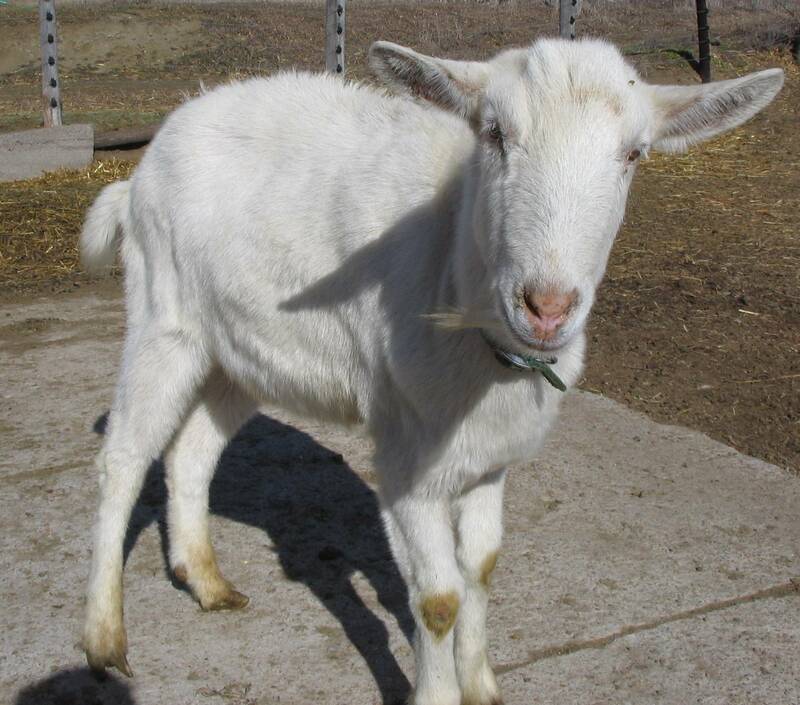 Coke is a very affectionate, bright and intelligent goat. Coke stands 35" at the wither. 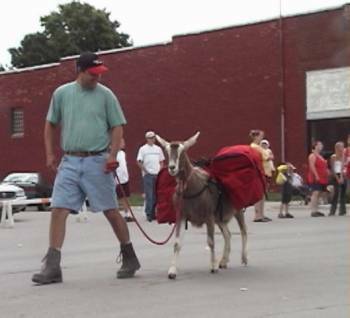 Coke is pictured here walking through our county's 4th of July Parade. Oscar is now living and packing in Arizona. Ernie is hanging out with Oscar in Arizona. Joey is a pure bred Toggenburg bred right here in Lincoln, Nebraska. Joey isn't quite as big as the other goats, but being a Toggenburg he wasn't expected to grow quite that tall. He is proving to us that bigger isn't necessarily better when you have a big heart and the desire to pack it all. Joey stands 32". Al is one of our largest Yukon sons. 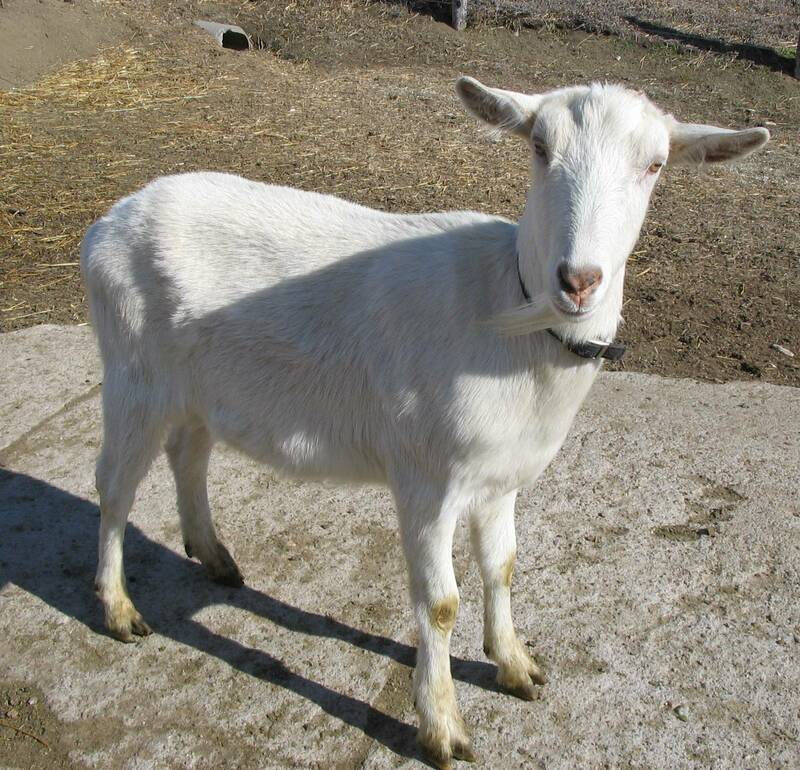 He is maturing into a nice looking goat. We can't wait to see how he matures. These two are twin brothers and purebred Alpines. Dutchess, the martriarch of our does, has been an outstanding producer for us and we are extremely happy to have these wonderful brothers in our pack string. 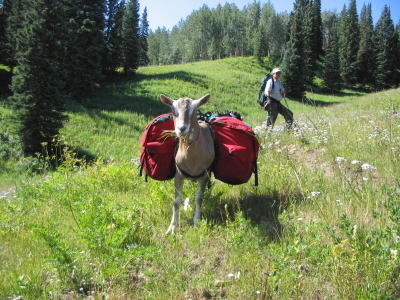 Hans went to Colorado with us in 2004, he's still growing and does great on the trail. Goofey if filling out to be a strong packer.